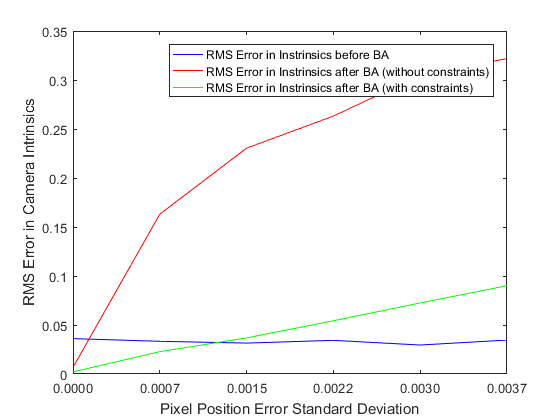 In the last post, we applied bundle adjustment to optimize camera intrinsic and extrinsic parameters keeping the position of the object points fixed. In this post we’ll relax that restriction and consider the general bundle adjustment problem where the position of the object points is optimized as well. We’ll use bundle adjustment both with and without the constraint that a single camera is being used and changing the camera parameters affects all image points. We will also consider exploiting the unique structure of the Jacobian matrix in the bundle adjustment problem that permit the use of matrix factorization techniques to solve the camera and structure parameters more efficiently than computing a direct matrix inverse. The jacobians of the image points with respect to the object points are added as shown below. For ease of implementation, we have rearranged the u/v coordinates, so that the image coordinates now appear in order (u1,v1, u2,v2..) instead of (u1 u2..un, v1,v2..vn). Our experimental setup is similar to the set up on part 3 of this series. We consider 16 points along the vertices of rectangles displaced from each other along the camera optical axis. This constellation of 16 points is viewed by 4 cameras. Every point is assumed to be visible in every view. We add roughly 5% noise to the camera intrinsic and extrinsic parameters and to the object point locations. The noise is normally distributed and centered on the true values of the parameters. The details of the simulation set up is described in the previous post. 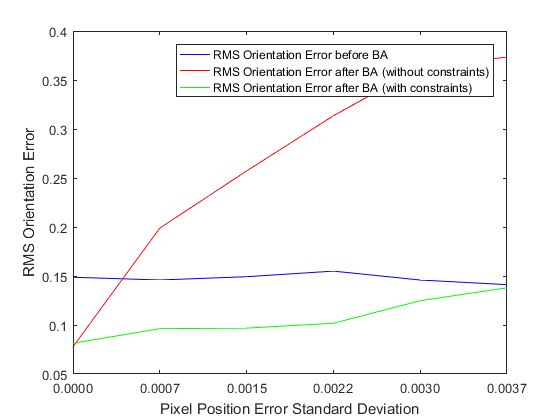 In the previous post we were only optimizing over the camera parameters and saw a gradual decrease in the performance of the unconstrained optimization in comparison to the constrained optimization. After adding the object points, the performance of the unconstrained optimization degrades much more rapidly. This is likely because after adding the object points, we have many more parameters to optimize over. The number of parameters are now 3*16 + 4*9 = 84 for unconstrained optimization and 3*16 + 4*6 + 3 = 75 for constrained optimization, while the number of equations is 16*2*4 = 128. Thus, imposing the single camera constraint becomes more important to obtain good results. As can be seen, the constrained optimization continues to make improvements to the starting guesses for the camera parameters and object points and the amount of improvement made decreases as noise is added to the image. 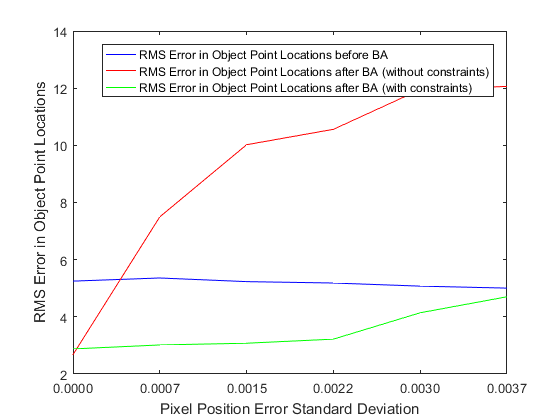 However, with the addition of the object point locations, the optimization is now more sensitive to image noise (particularly for the intrinsic parameters). This is expected, as the number of parameters to optimize is significantly larger. It is important to keep the image noise level low. For a 1000*1000 image, one should try to obtain features with a 1 pixel accuracy. So far, we have been solving for the parameter update by computing a direct inverse of the Hessian matrix. Doing so is both inefficient and error prone. As the size of the bundle adjustment problem gets larger, the Hessian matrix becomes more ill-conditioned. For example, the typical condition number of the Hessian matrix is ~1e -10 (calculated using rcond function in Matlab). Morever, calculating the inverse (a operation) gets prohibitively expensive as the size of the Hessian gets larger. will consist of diagonal blocks if the camera parameter blocks are independent (unconstrained optimization). When the single camera constraint is enforced, will no longer be block diagonal. The block diagonal structure of the arises from the fact that changing the coordinates of a 3D point only affects the image coordinates of that point and thus should always have the block diagonal structure. The complexity of calculating is thus where is the number of object points. 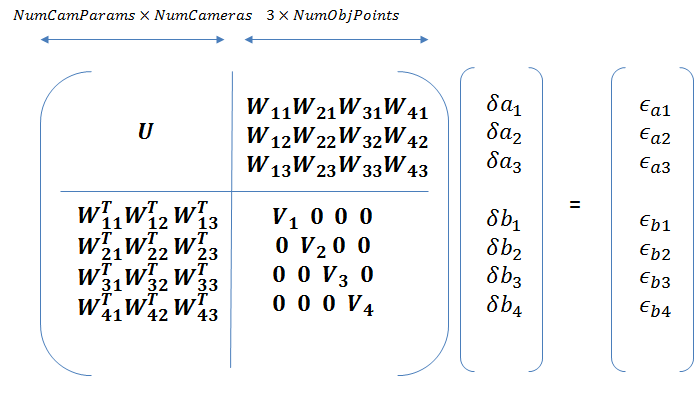 Since the number of object points is typically much larger than the number of cameras, this can lead to significant reduction in computation time. The condition number of the matrix is also much higher, and therefore computing the inverse of is numerically more stable than computing the inverse of the original Hessian matrix. The Matlab code for computing the parameter updates using this method is shown below. For simplicity, we are not taking advantage of the block diagonal structure of in this code and instead computing the inverse directly. As noted by Haralick2, appropriately scaling the image points is critically important in obtaining a numerically stable solution for the fundamental matrix. A similar principle applies to the bundle adjustment problem. I scaled the focal length by a factor of 1000 to obtain typical image coordinates in pixel dimensions (of the order of 100s). 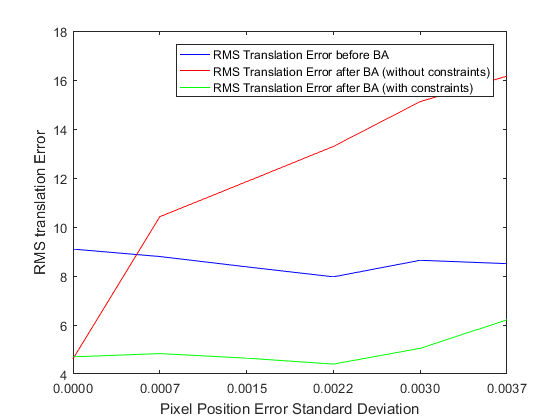 Running the BA optimization on the scaled image coordinates produced very poor results. I then scaled the image points and the objects points as noted by Haralick such that the points are centered about the origin and the mean distance of the image points from the origin is and that of the object points from the origin is . Doing so restored the numerical stability of the bundle adjustment optimization. 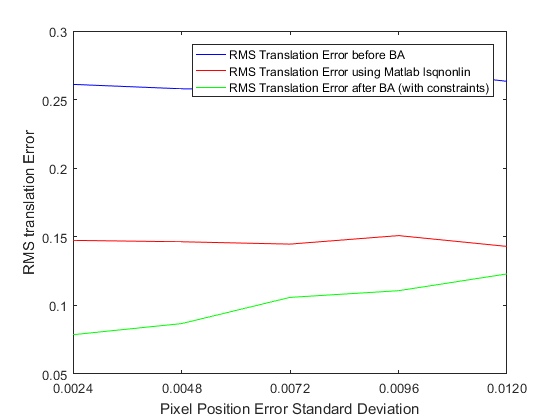 The Matlab code for the normalization functions is shown below. % returns the transformed points and the transformation matrix. In the results shown so far, we have used an axis-angle parameterization for rotation. The axis-angle representation enables a rotation to be represented by three numbers, which is the minimum required. Axis-angle representation is superior to the Euler angle representation as it doesn’t suffer from singularities. Another popular parameterization for rotation is a quaternion. A quaternion however uses 4 numbers to represent a rotation with the constraint that the norm of the quaternion is equal to 1. we implemented a version of the bundle adjustment optimization using quaternions (the major changes are that the extrinsic parameters vector is now a vector and jacobians with respect to the quaternion elements have to be used) and found that the performance is quite poor. The reason for the poor performance is likely the extra degree of freedom introduced by using the quaternion representation. The unit norm constraint can be enforced by using lagrange parameters. Schmidt and Niemann also present a technique to enforce the unit norm constraint without using lagrange parameters3. I have not implemented this technique. 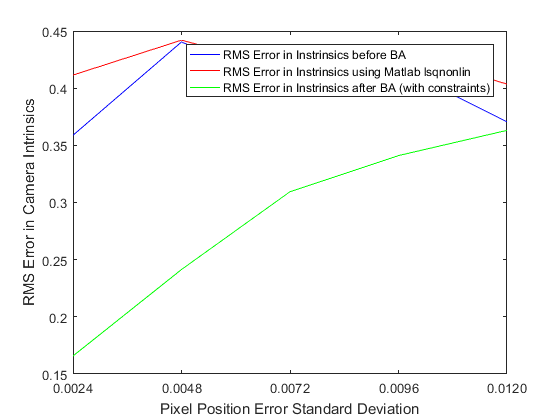 Matlab provides built-in implementation for many least squares optimization methods such as Levenberg-Marquardt and Trust-Region-Reflective. 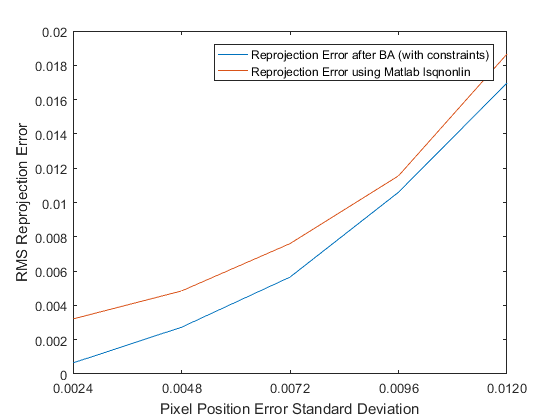 We compared the image reprojection errors and orientation, translation, instrinsic parameters and object point estimation errors of our BA implementation with those of Matlab. To recap, our simulation procedure is shown below. % with 0 mean and current std dev. 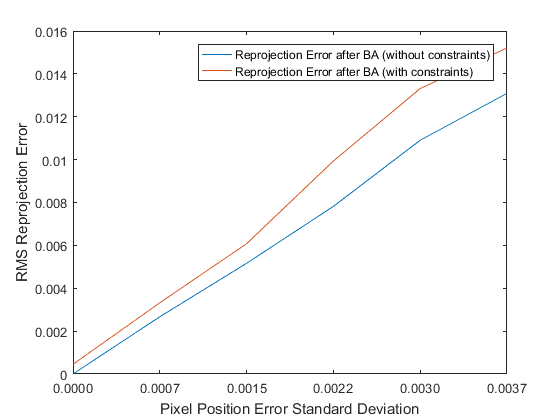 Our implementation of BA produces lower reprojection errors and performs significantly better in optimizing the camera parameters. 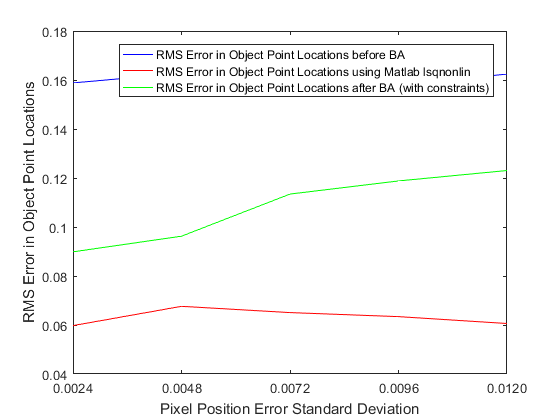 However, Matlab’s implementation outperforms our implementation in optimizing the object point locations. 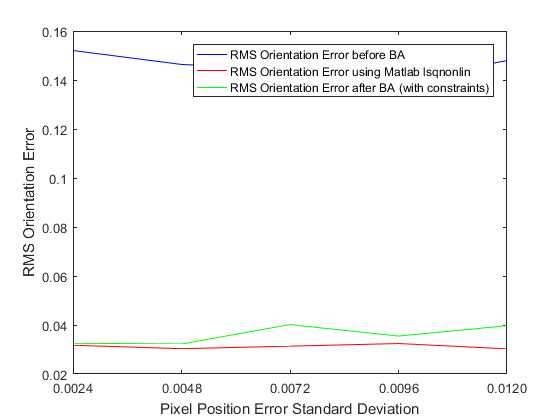 One major difference between the two implementations is that Matlab’s optimization doesn’t enforce the single camera constraint. The intrinsic parameters of the optimized cameras are different from each other. Matlab’s implementation is also slower than our implementation. This could be because of the need to numerically approximate the jacobians by using numerical differentiation which leads to many more evaluations of the objective function. One shouldn’t read too much into these results however, for larger data sets, the results could be different. Hartley R. In Defence of the 8-point algorithm. In Defence of the 8-point algorithm. http://www.cs.cmu.edu/afs/andrew/scs/cs/15-463/f07/proj_final/www/amichals/fundamental.pdf. Published June 1997. Schmidt J, Niemann H. Using Quaternions for Parametrizing 3–D Rotations in Unconstrained Nonlinear Optimization. citeseerx.ist.psu.edu. http://citeseerx.ist.psu.edu/viewdoc/download?doi=10.1.1.24.659&rep=rep1&type=pdf. Published November 21, 2001. Accessed February 20, 2017.